For many children, entering secondary school is a shock. Not only are they faced with brand new faces and brand new surroundings, but many also are coming head-to-head with a brand new concept: homework. Homework is an alien idea for many primary school pupils today, so they feel lost when they make the transition to secondary school. But if you set up good habits from the start, soon they will become ingrained and as natural as breathing – fingers crossed! Purchase the right organisational materials. Listen to what the teachers and tutors say, and get the right notebooks, the right dividers, the right pens and pencils. It’s difficult to find essential items when everything is crammed haphazardly into a bag and not organised properly. Learn how to be efficient. Set up a work area. A desk in a bedroom is ideal, but if space is limited, clear off a corner of the kitchen table, or get a lap desk to use on the sofa. What’s important is that your child has the same clean, empty area to do homework in, on a daily basis. Keep homework time free from distractions. Your child’s study area must be an electronic-free zone, which means no telly, no computer (unless it’s a computer that is used for schoolwork only) and no mobile phones or hand-held consoles. Set strict ground rules from the start. Most children do better when they have a set routine, and putting one in place will also lessen the chance that your child will leave everything until the last minute. Slow and steady wins the race – this is certainly true when it comes to homework. Depending on your child’s age, insist on a certain amount of homework time every day – an hour for Yr 7 students, for example; longer as they get older. You might want them to revise immediately after coming home from school, you might give them a two-hour break and then have them start their revision. Only you know which approach will work best for your child. Keep in mind that when your children were younger, sticker charts and other “bribes” such as the promise of a special toy or an afternoon out worked wonders, whether you wanted them to finish their homework, clean their room regularly, or practice a musical instrument. Your children are now old enough to do their work independently, but parental involvement is still key when it comes to getting good results. Your interest and your approach to homework – and learning in general - will have a tremendous effect on your child. Don’t forget that helping your children understand the world around them is still important, even if your children are older. Encourage them to read newspapers, watch the news and simply read books for enjoyment. You might want to read the same book, and then discuss it. If your child is learning about ancient art or botany, you might plan a weekend trip to the museum or to a horticulture exhibit. Making learning come alive outside school will add to their understanding and enjoyment inside school. Children learn best when they feel they are doing things well, and that someone appreciates both their efforts and their accomplishments. Too often teachers don’t have the time or the luxury to reward every student on his or her progress. That’s where parents can make all the difference. 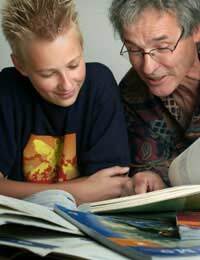 Keep involved in your child’s homework, and give them regular praise. Be there to offer encouragement and guidance, and to help when they don’t understand something. Don’t be afraid if you are unable to help immediately: hopefully, the two of you together can work to find the solution.